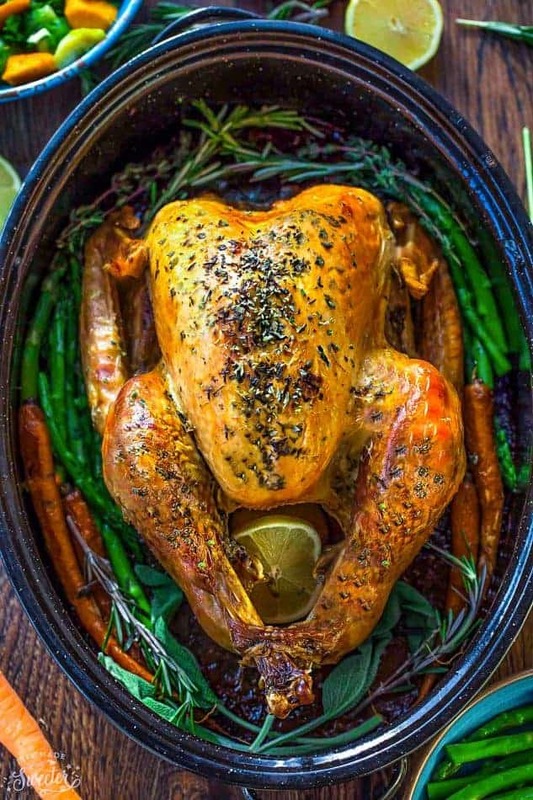 Butter Roasted Turkey – Juicy, and delicious, this is a perfect serving for Thanksgiving or Christmas. If your turkey is frozen, allow 2 to 3 days for it to fully defrost in the refrigerator. Remove giblets & neck, rinse & pat dry. To make the butter: In a medium bowl, combine butter, rosemary, sage, thyme, parsley, garlic, salt and black pepper and stir together until smooth and combined. Carefully loosen the skin from the turkey breast with your hands lifting and separating the meat. Do the same for the neck as well as the thighs and legs. Gently rub half of the butter under the skin using your hands and fingers and place 3 sage leaves and 2 thyme sprigs under the skin. Tie the legs together and tuck the wings underneath the turkey, using small skewers to secure, if necessary. Place 1/3 of the onions, celery, carrots, 2 sage leaves, 2 thyme sprigs, 1 rosemary sprig and lemon halves inside the cavity of the turkey. Place turkey, breast side up in a large roasting pan. Melt the remaining butter in the microwave and brush an even layer over the skin of the turkey. Arrange remaining carrots, celery and herbs in the pan around the turkey. Pour chicken broth to the bottom of the pan (will be using liquid to baste turkey). Preheat oven to 425°F and position rack on lower third of the oven. Once oven is ready, place the roasting pan in the oven and cook for 45 minutes. After 45 minutes, reduce the oven temperature to 350°F and continue to roast until a meat thermometer (inserted deep into the thigh but away from the bone) reads 180°F and juices in the thigh run clear when pierced with a fork, about 2 to 2 1/2 hours (or longer depending on your oven), basting with pan broth & drippings every 30 minutes. Cover loosely with foil if turkey browns too quickly. Remove turkey from the pan and onto a baking sheet and let rest for 15 minutes before carving. Strain and reserve pan juices for gravy, if desired, and discard vegetables.